Please click here for your copy of the 2019 Raker-Roberta's Catalog. Please click here to listen to the 2019 Raker-Roberta's Spring Program Webinar. 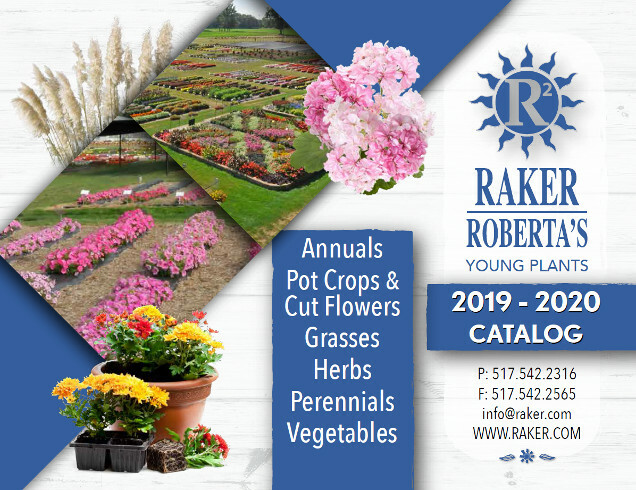 Please contact Raker-Roberta's (517-542-2316) for a printed copy of the 2019 Raker-Roberta's Catalog. For 2019, Raker Roberta’s is offering a Summer/Fall plug and liner program of seed annuals, perennials, and pot crop varieties available for shipment in weeks 27 through 44. Seed annuals utilized for Fall sales are competitively priced for this time frame and market are significantly less than the spring program pricing. An extended list of Pansy and Violas are offered during this time frame in our 1602 HD Tray, 288 Tray, and our 338 size tray for high volume users. R2 offers the largest Early Order Discount in the industry of 10% on any orders placed for this time frame by June 1st, 2019! Click here for a complete listing of our product offered for Summer/Fall 2019. For 2019, Raker Roberta’s offers 40 varieties of Poinsettias by breeders Selecta, Dummen, and Syngenta. Poinsettias are offered in a 25 strip tray which is our standard 36-strip tray with the center 11 cells empty to promote lateral branching. Our Poinsettia liners are well rooted at delivery and are ready to take-off immediately after transplant. R2 offers the largest Early Order discount in the industry of 10% on any poinsettia orders placed by May 8th, 2019. Click here for R2 2019 Poinsettia Liner Program. Availability is limited and R2 no longer custom grows this material to order. Please check our current availability to place your orders. 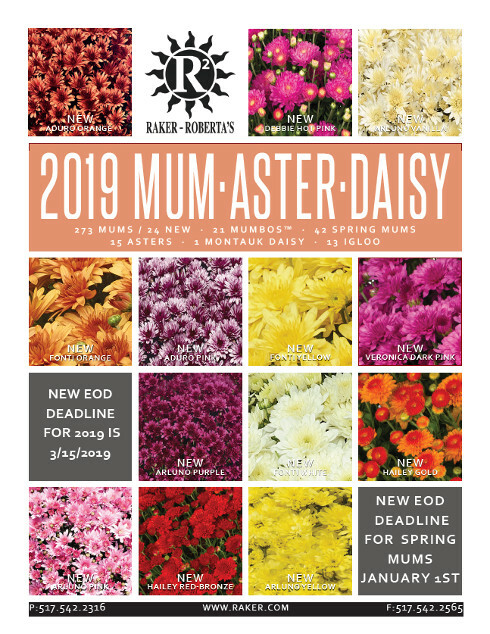 For 2019, Raker Roberta’s offers a large selection of mum aster and daisy liners from breeders Gediflora, Dummen, and Syngenta. This offering includes 24 New Mum variety introductions for the 2019 season, 21 Mumbo™ combination liners, a selection of Igloo Hardy mums and Asters for Fall production. Items are available in our 51- Strip Tray, a 51-Strip Pinched Tray, and our High Density 160 tray to accommodate your needs. Chrysanthemum, Aster, and Mumbos are available to ship in weeks 17-30. Igloo Hardy Mums are only available to ship in weeks 23-26. Selections of 42 Chrysanthemum varieties are available for spring shipping between ship weeks 5-16. Click here to see a list of the Mum varieties available to ship for May flowering production. 10% Early Order Discount on orders for Spring Mums on orders placed by 1/1/19.